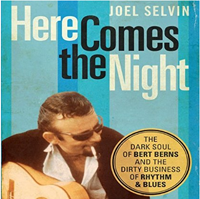 Here Comes the Night by Joel Selvin is the tragic story of a key personality in the 1960s and comprehensive account of the Rhythm and Blues business. Here Comes the Night: The Dark Soul of Bert Berns and the Dirty Business of Rhythm and Blues covers a myriad of popular artists and the surprising hidden stories of their careers and most popular songs. Here Comes the Night was provided to me by Audible.com in exchange for my review. Here Comes the Night is a raw and dirty look at the inside of the music industry. For this reader this unprecedented access was surprising. The groups of the 1960s were what my Dad listened to in the 1970s and 1980s, so this reader was very familiar with many of the artists and count many of the songs as favorites. Written by San Francisco based music journalist, Joel Selvin, Here Comes the Night is a treasure trove of information. Selvin reads like a man who has researched well but also has the inside track understanding that sometimes these stories are stranger than fiction. While listening to the non-fiction work doing household chores or at work, I frequently found myself; chin in hand, paying rapt attention to the narration. Selvin’s construction is rapid fire. Readers are taken between scenes and personalities. We see young Phil Spectre at the start of his career. While Spectre wasn’t well liked, he had an ear that no one could fault. We see a popular song go from one artist to another. We see the same song competing and succeeding based on the appeal of the artist to an audience. Music is, after all, a business and its one in which backs have to be watched. Selvin’s writing style seems to have been focused on chronology and giving us a background look at people as they step into the scene. The narrator, Christian Rummel, has a smoky voice and flat and dispassionate way of speaking with an ever so slight country accent fit the subject matter well. This is the tired guy with a shot of whiskey at the country bar reminiscing about the questionably good old days. The R&B world is where men say what they mean and spare no time for what is politically correct. Listening to the e-book version of any non-fiction work is different from reading the piece. Given the pure breadth of information, I’m not sure I would have been able to keep track of the story had I been reading it. Listening to Rummel’s rendition of the work brought life to the people and their personalities and without that boost, there may have been a lot of going back. Still, the mention of songs caused them to spring into the brain like the best sort of earworm. I had never heard of Bert Berns before reading up Here Comes the Night and the book does divert from him frequently but he is a man that I will not soon forget. He wrote a number of my favorite songs including “Brown Eyed Girl” and “Under the Boardwalk.” Berns was a key player in the history of R & B and the British Invasion and this accounting of his life and the working of the world in which he invested himself is fascinating. Berns tragic end is just one facet of the heartbreak of the music industry. Selvin does not discount Berns as the industry giant that he was while conveying the fragility of his life and his ultimate loss after leaving an indelible mark on the movers and shakers and the songs that we remember with fondness and smile whenever they play. Here Comes the Night is a fabulous non-fiction read for any fan of music of the 1950s or 1960s and the big personalities that produced that music. Here Comes the Night is the less glamorous side of the music industry and I could not have been more captivated by the subject matter, narration and a subject matter I never knew interested me until now. Listen to the first minutes and buy Here Comes the Night by Joel Selvin on Audible. For more information about Joel Selvin and his work, visit his website. You can connect with him on Goodreads and Twitter @Joelselvin.